It had long been a wish of U of R School of Education’s Margo Drallos, director of the Fieldwork and Advising Office, and Adjunct Professor Denise Gideon to invite two of their colleagues from Haiti to University of Redlands. Last week, with School of Education Dean Andrew Wall’s support, that idea became a reality. 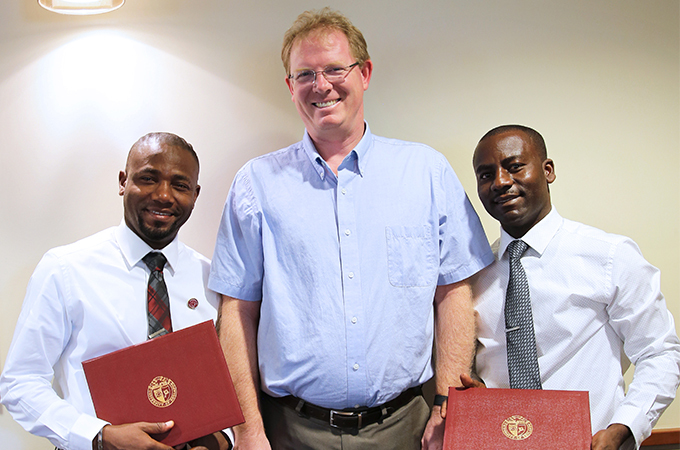 The visit strengthened the longstanding partnership between the University and the Haitian educational community. Much of this partnership has taken place through For A Reason (FAR), a nonprofit organization founded by Gideon and partners after the devastating 2010 earthquake in Haiti, which destroyed most schools there. The organization—which is committed to long-term sustainable change, operated and delivered by Haitians—aims to provide a coordinated effort to accompany students and their families as they pursue their educational goals. Witnessing the slowness of the recovery effort and its impact on the Haitian educational system, Celestin and Ceus, who had worked for a Haitian university before the temblor, worked with FAR to train teachers and teach children. In 2014, the team came together to meet a new challenge, a requirement from the Haitian government that the country’s teachers be credentialed. This requirement was especially difficult to meet in isolated rural regions, where teachers often had only a year or two more education than the students in their classrooms and teacher training courses were practically nonexistent. In response, several School of Education faculty members visited Haiti and coordinated with Celestin and Ceus to help provide coursework to support those teachers in their classrooms and encourage their pursuit of full credentialing—ultimately supporting the students in rural Haiti. This summer, the Ministry of Education in Haiti officially approved adapted School of Education coursework for teacher professional development.